Is Tesla’s Powerwall really that great? For about a month ads appeared in my Facebook timeline trying to sell alternative energy solutions. They pushed the Tesla Powerwall as a good solution because it is “pretty”. For a technical person “pretty” is very low on the list of reasons why you will buy something that will be bolted onto your garage wall. Tesla uses lithium-ion technology in their batteries. 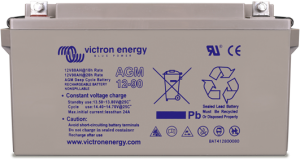 Most solar or wind installations at the moment use lead-acid batteries. This prompted me to look at the differences between lead-acid and lithium-ion and which is the better choice of the two technologies for a run of the mill installation. The first thing to note is that Tesla already stopped selling the high power version of the Powerwall. Customers misunderstood the specifications and used the battery incorrectly causing early failure. 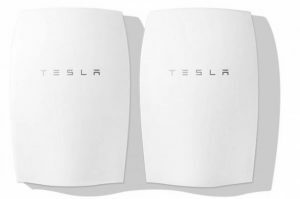 Tesla is still selling the lower power Powerwall. The Tesla Powerwall has a capacity of 6.4 kWh and it has a nominal voltage of 350 to 450 volts. The voltage is non standard for most of the shelf inverters and solar charge controllers, so you may have some difficulty finding an inverter (SMA sells appropriate inverters). Tesla also uses lithium-nickel-manganese-cobalt chemistry as opposed to the lithium-iron-phosphate chemistry most other suppliers use for solar and backup systems. Details about the different lithium-ion chemistries are available at the Battery University. In my opinion lithium-iron-phosphate is the better choice because it is more robust with a slightly lower energy density than the other lithium-ion chemistries. I will compare lead-acid with lithium-ion batteries but the numbers are based on lithium-iron-phosphate batteries. The only reason I’m doing this is because I have more practical information available for this and the comparison will still be valid when comparing to the Powerwall. General accepted wisdom is that the most economic and practical depth of discharge (DOD) for a lead-acid battery is 50%. For lithium-iron-phosphate (LiFePO4 or LFP) 80% DOD is used. How does this work out in the real world? Let’s take lead-acid batteries with similar capacity to the Powerwall capacity of 6.4 kWh. To get reasonably close to the 6.4kWh we can use four 200 Ah lead-acid batteries that will give you 7200 kWh. The usable energy of the lead-acid batteries will be 3600 kWh where the usable energy of the lithium battery will be 5120 kWh. To have a comparable usable energy with lead-acid batteries we will have to add another 3040 kWh to our lead-acid batteries. This means we will have to buy lead-acid batteries with nearly twice the capacity of the lithium batteries to have the same useable energy. This does not take into account, the ageing of the batteries, temperature derating or the effect of higher loads. For lead-acid batteries, higher loads have a greater effect than on lithium. Based on all this we can say that lead-acid batteries will need to be twice the kWh rating of a lithium battery. The Tesla Powerwall costs about $3000 and a quick search on the internet indicates that good quality lead-acid batteries with the required capacity will cost between $1500 and $2000. You may conclude that lithium batteries are not cost-effective, but useable energy compared to price is only part of the story. If you are concerned with the weight or size of your batteries Lithium batteries win by far. Lithium batteries are about 4 times lighter than lead-acid batteries and this is important in mobile applications but not really for the application the Tesla Powerwall is intended for. Lithium batteries handle large loads much better than lead-acid batteries. Lithium batteries have a great advantage over lead-acid batteries in that you can charge them at a much higher rate. Lithium batteries have a greater charge efficiency than lead-acid batteries. If you charge your batteries with a diesel or petrol generator you will save money using lithium batteries. Depending on how you treat your batteries they will have different charge cycles. The amount of charges available for your batteries directly relates to how long they will last. The amount of charges depend on the DOD and also if your batteries are correctly configured for the load. Temperature also play a role, the hotter the battery the shorter its lifetime. You can expect 2000 to 4000 charge cycles for lithium batteries and for lead-acid batteries you can expect 400 to 1500 charge cycles. If we assume that you charge your batteries once a day and that conditions are ideal a lithium battery will last a little more than 10 years and a lead-acid battery will last a little less than 4 years. Note: Even in a worst case scenario a lithium battery will last longer than a lead-acid battery in a best case scenario. It is quite obvious that if you have the capital available when you install your batteries you will be better off with a Powerwall. If you buy from other manufacturers than Tesla the choice between lithium and lead-acid may be more difficult because Tesla’s Powerwall has a very low price. Weekends are supposed to be fun, Aren’t they? However, lead acid 50% the cost and can be customized and added to/expanded easily. Powerwall sounds awesome but are you absolutely sure you can go 10yrs and 4000 cycles with lithium? Are you sure their capacity will not diminish over time? I have a friend with a Nissan Leaf that has lost 30% of his battery capacity in ~3yrs and can no longer drive it to work in the Winter (even less capacity in the winter). I really want to hear from someone that has owned the Powerwall for several years of testing to see how it ‘really’ performs. You can see the cycles for the different lithium technologies at the battery university link above. The optimistic 4000 cycle number is from Victron a battery manufacturer but just like I did, they say between 2000 and 4000 cycles for LiFePo batteries. Tesla gives a 10 year warranty on the powerwall. Tesla also withdrew the larger capacity Powerwall because people used it in daily cycle applications where it was designed for standby use making it fail very quickly. Also remember the DOD numbers that i tried to explain in the post, lead acid is more expensive than you think at first because of the 50% DOD requirement.